This bag makes traveling look easy. 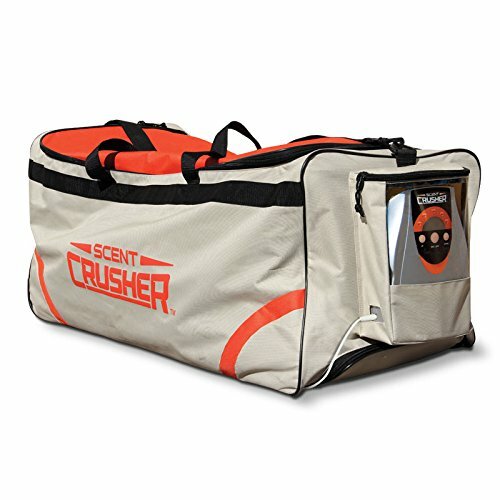 The roller bag by Scent Crusher comes with all the amenities of the Scent Crusher gear bag but gives you the extra space needed for those long hunting trips. Similar to most luggage pieces, the roller bag has incorporated an Extendable handle and heavy duty wheels. The roller bag is also airport/TSA compliant and comes with a One-Year warranty. Features: - roller wheels are heavy duty - heavy duty liner, zippers and adjustable shoulder strap - maintenance free digital Ozone generator included - 12V adapter and 110V charger included. Specifications: - roller bag size: 42" L x 18" W x 14" h - handle extends: 9".